Love this one! My kids loved the beach too! Me too! My kids just loved the beach. I took them camping all the time there. It was so much fun! now I can have fun with my granddaughter! Love this idea. 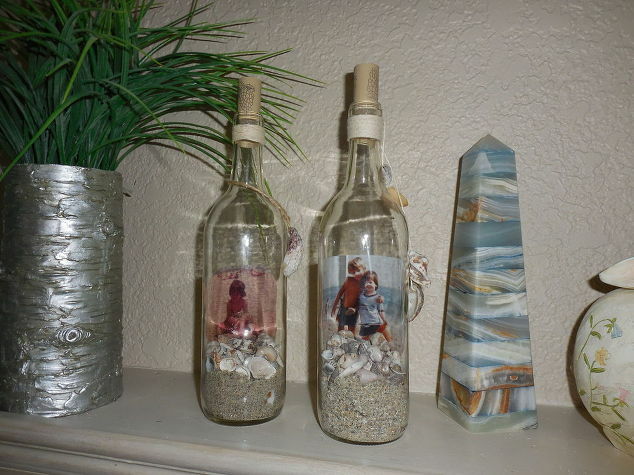 We’re fortunate to live near beach and always on the lookout for new craft projects using shells. Wonderful Lesley! Stay tuned for lots of shell projects this summer…Start saving your shells. There are just soooo many ideas! Those are so cute! Your beach memory is adorable. I love your easy crafts! For those of us that don’t go to the beach, I wonder if a dark brown sand could be used, with maybe a little artificial pine branch, a few pretty pebbles, and a couple of tiny fully dried pine cones. Then tie a heavier jute around the neck with a tiny pine cone. Insert a picture of a kid in a hoodie….. Thinking a cool hands on craft for workshop…..
Great ideas Robin! Sounds like this put your brain in overdrive! It happens to me all the time too! This idea would work for all of your great ideas. That was suppose to be a :D. I have no idea what ;d is. Lol. It was the result of fat fingers on my part. Great idea! I wish I would have done this when my kids were little. So creative! OH what a fun idea. Great for the family to do. Thank you so much…it is fun! Kids will enjoy collecting the shells. I put a picture of them collecting the shells inside….I saved those shells over 30 years…..and no…I’m not a hoarder. Hi Crystal, I have been advertising with ads and links on my posts in hopes I can make enough to support the giveaways. I will be having one in April. Good luck! I love your site. I love seeing your ideas. I just didn’t know if I missed it or not. Glad things are OK. How’s doggy? It’s all going great Crystal. Doggie is excellent! Both of them, and things are great! Thank you so much for asking.